Why would you want to implement this? By default, when a visitor only visits one page, Piwik (and Google Analytics as well) tracks the entire session as 0 seconds. This happens because of the way Piwik calculates the time spent on a page – comparing the time of the first pageview to the time of the next one. Happily, it is possible to configure Piwik so that it more accurately measures the time spent on the last page of a single visit. Unfortunately, we need to add a special line into the Piwik tracking code. 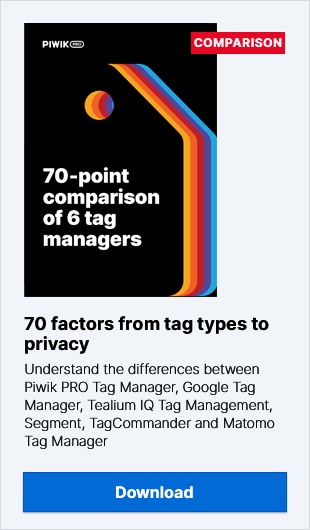 Fortunately, however, we can do this by firing another tag using the Piwik PRO Tag Manager. This is a good place to stop and explain a bit more about this code. In its standard form, it tells Piwik to send requests to count the actual time spent on the page, in other words, when the user is actively viewing the page (i.e. when the tab is active and in focus). These heartbeat requests will not track additional actions or pageviews. Set an easily recognizable Trigger name – you can reuse it later. Leave this as is – look at the text: Fire tag on all pages – exactly what we want to do.